Rev Luna Dingyan will be the guest speaker on Friday at the Deacons Conference. 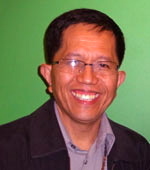 He is a minister and key leader of the United Church of Christ in the Philippines. He is the President of the Ecumenical Theological Seminary in Baguio, the Philippines. ETS is a UCCP college, but is established with an ecumenical mandate and provides training and resources for several Christian denominations in the region. Opening in 1996 in cramped, rented premises, with a tiny staff and small student body, ETS has doubled its enrolments every year since. Its resources are still very meagre but through the leadership of Luna and his wife Perla, ETS has pioneered a curriculum and pattern of delivery that responds to the missional priorities of the UCCP among the poor of the Philippines. It grounds biblical and theological studies in community development, human rights and Christian leadership. Teaching is mostly done in short term intensive blocks and regional seminars, supported by distance mode learning. All students are serving as pastors in the diverse settings, and frequently dangerous settings that characterise the UCCP’s ministry. Luna’s theological research has been in the area of “a Christology of solidarity”. He is a fine scholar and educator, and an inspirational church leader. (Luna will also be a Bible Study leader at the 13th triennial Assembly of the UCA in July).